A Documentary Film examining the elusive North American Trabant, an East German auto which was NOT made for the American marketplace. 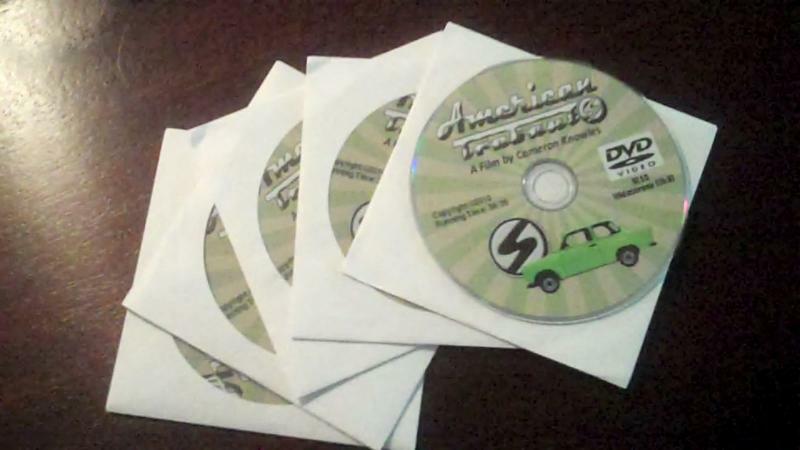 The DVD American Trabants is now on sale. It will be shown on MCTV 99 (digital 994) on Charter Communications cable in the Midland area. Purchase your own copy! Details below. Finalizing plans to show my documentary film, "American Trabants" at Midland, Michigan's Northwood University, Thursday, February 14th @ 7:00 PM at the Bennett Sports Complex Auditorium. Also prepping a Q&A session about the car, and the business end of making a documentary film. 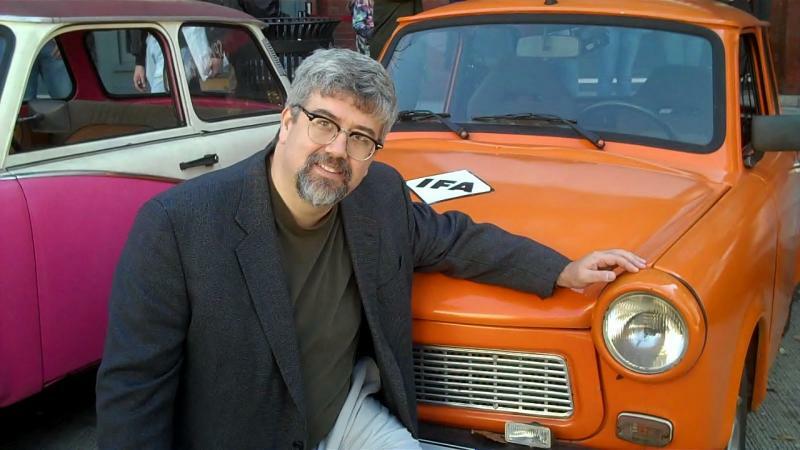 Join me at the 2012 Parade of Trabants at the International Spy Museum in Washington, D.C. starting @ 10:00 AM. I'll have copies of the DVD, "American Trabants" available for $15 (plus tax) and look forward to re-connecting with some of the people who appear in the film! Can't the event, see how to buy a copy above on this page! Check out the Facebook photo album. No login required! Just added, screenings at the The Good Beans Cafe in Flint, Michigan and the Riverside Saginaw Film Festival, Saginaw, Michigan the weekend of November 4th - 7th, 2010. The Good Beans Cafe: Thursday, November 4th, 6:00 PM, 7:00 PM, 8:00 PM. No Admission Charge. Read about the Saginaw festival here! American Trabants will have a Pre-Release screening Saturday, August 7th in Augusta, Kansas at the Augusta Historic Theater. Screen times are 1:00 PM, 2:00 PM, 3:00 PM and 4:00 PM. Special thanks to Trabant owner Bill Morris for arranging the showing! 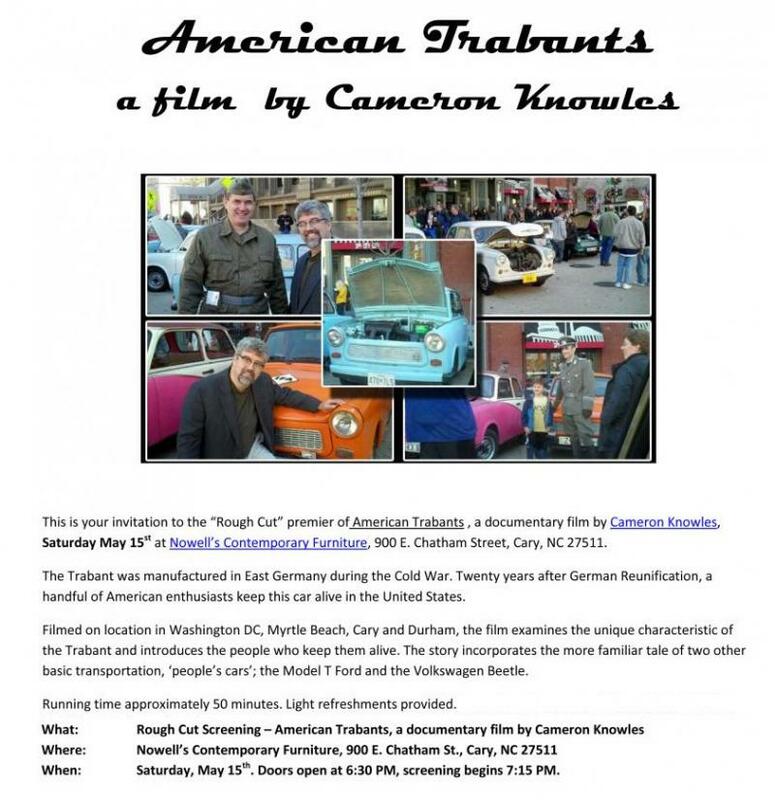 The 'rough cut' premier of "American Trabants" is scheduled at 6:30 PM for Saturday, May 15, 2010 at Nowell's Contemporary Furniture, in Cary, NC. Right click the image below to save it and print it! It looks like April will be a big month as the film proceeds into final editing. Watch details soon about a 'rough cut' preview coming soon in the Raleigh-Durham are. This video is a sneak peek at the final project. Click here! Check back for release date and scheduled showings!